Protein-based biologics are gaining tremendous interests in the biomedical field after several successful translations into commercialized products. To this end, key hurdles in the development of protein-based therapeutics need to be properly addressed first. One of the most prominent issues is the instability of protein therapeutics in vivo, which requires higher and more frequent doses. As a result, protein-based therapy can become prohibitive in cost and may pose potential safety risks. Engineering protein therapeutics using biomaterials offer unique strategies to solve this problem by prolonging the half-life and enhancing the efficacy of these. In this blog, we feature three articles published in Biomaterials Science recently on the topic of Engineering Advanced Biologics as therapeutic agents. The authors reported the chemical conjugation of basic fibroblast growth factor (bFGF) onto hyaluronic acid (HA). Such multivalent conjugates were envisioned to increase residence time in vivo, protect bFGF from enzymatic degradation, and enhance protein bioactivity. Using a small molecule linker (N-(ε-Maleimidocaproic acid) hydrazide), bFGF was successfully conjugated at two different protein-to-polymer ratios and their structures were confirmed by extensive physico-chemical characterization. Compared to bFGF alone, HA conjugated bFGF displayed enhanced activity to promote the proliferation and more interestingly, the scratch closure of human umbilical cord vein endothelial cells. It’s noteworthy that the protein-to-polymer ratio and the conjugate size are two key parameters that could be easily tuned to modulate the bioactivity of the conjugate. Similar to the strategy discussed above, the authors also utilized the biocompatible HA as carrier to conjugate epidermal growth factor (EGF) which is otherwise labile in vivo. The enzymatic degradation and stability studies revealed the superior stability of EGF when conjugated with HA. In vitro, HA–EGF conjugate increased keratinocyte proliferation, VEGF secretion, and migration towards scratch closure when compared to EGF alone. In vivo, HA–EGF conjugates loaded HA patch closed the wound in a rat model by enhancing de novo ECM secretion and mitigating inflammatory response. Overall, those comprehensive studies demonstrated the significance of protein-HA conjugates in improving the therapeutic effects of protein biologics. Here, the authors aimed to improve the delivery of TNF-α-stimulated gene-6 (TSG-6) for treating osteoarthritis. Specifically, they focused on heparin, another glycosaminoglycan, as a carrier biomaterial for TSG-6 delivery. It was first discovered that N-desulfated heparin maintained the beneficial role in promoting the bioactivity of TSG-6. Microparticles were thus made from N-desulfated heparin followed by TSG-6 encapsulation. TSG-6 was able to be released and demonstrated significantly higher anti-plasmin activity compared to soluble TSG-6. In a rat medial meniscal transection model, treatment of TSG-6 delivered by N-desulfated heparin but not in soluble form resulted in similar cartilage thickness, volume and GAG level compared to uninjured cartilage. These results showcased the advantages of heparin based microparticle in preserving and enhancing the bioactivity of therapeutic TSG-6 protein. The geometry of micro- or nano-materials determine their physico-chemical properties and play crucial roles in directing an array of in vivo biological activities. 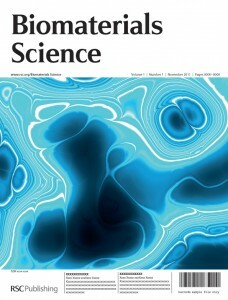 Historically, the significance of micro-/nano-geometry for biomaterials has not been adequately appreciated due to the limitations in manufacturing techniques. Recent years have witnessed the exponential growth of micro-/nano-fabrication technologies which allow closer scrutiny of the relationship between the micro-/nano-geometry and the biological effects of materials. This month the focus is on three articles published in Biomaterials Science reporting the recent advances to achieve controlled micro-/nano-geometry of biomedical devices including microdisks, nanosheets, and microcapsules. The heterogeneity in the geometry and loading level represents one major drawback of synthetic vaccine constructs. Therefore, taking advantage of the facile and flexible technique of soft lithography, the authors designed and fabricated PLGA microdisks with controllable dimension and payload loading. Compared to the conventional PLGA microparticles made by emulsion, microdisks possessed highly uniform diameter with less variation. Importantly, microdisks could safely co-deliver vaccine antigen and molecular adjuvants to primary dendritic cells. As a result, dendritic cells could be activated according to the composition of antigen and adjuvants. This controllable and programmable microdisk system will serve as platform to probe the relationship between the vaccine design parameters and immune responses in vivo. To elucidate the in vivo behaviors of Pd nanosheets (NSs), the authors synthesized size-specific Pd NSs (with 5 nm, 30 nm, or 80 nm in diameter) by controlling the chemical reaction conditions. Those NSs were then administrated via oral feeding or intraperitoneal injection to reveal different biodistribution, excretion, and toxicity profiles of those size-specific NSs. Interestingly, when intraperitoneally delivered, larger sized Pd NSs (80 nm) had higher accumulation in liver and spleen than the smaller sized Pd NSs (5 nm), which had higher accumulation in tumor tissue. In addition, the smaller sized NSs (5 nm) exhibited more excretion through urine than larger sized Pd NSs (30 and 80 nm). Overall, this study indicated that the size of nanomaterials could have significant influence on their biodistribution and bioavailability in vivo. To achieve the goal of developing controllable local delivery system for treating epilepsy, the authors developed drug-loaded PLGA based microspheroids, microspheres, and microfibers by tuning the solution concentration during electrojetting (electrospinning and/or electrospraying) process. All the resultant microcapsules had excellent shape and size uniformity with high controllability and low variance. 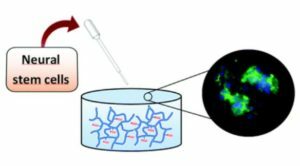 Different microcapsule geometry led to various sustained drug release profiles in vitro without compromising their cytocompatibility. This study highlighted the potential of programmable and controllable delivery system and suggested the potential role of geometry in controlling the drug release profile of micron-sized biomedical device. If you’re a regular reader of our blog hopefully you’ve already read about the launch of Biomaterials Science; but in case you haven’t Biomaterials Science is a new journal published by RSC Publishing in collaboration with the Institute for Integrated Cell-Material Sciences, Kyoto University, Japan. You can read about the scope of Biomaterials Science here, but briefly Biomaterials Science will cover the fundamental science of biomaterials through to their biomedical applications. Biomaterials for tissue engineering and regenerative medicine is an important topic covered by Biomaterials Science so to celebrate the launch, and highlight the area, we’ve made a selection of articles from across RSC journals free to read for 4 weeks. To celebrate this we’ve made a few articles published in RSC journals free to access for 4 weeks. I hope you enjoy reading them. Articles in Biomaterials Science will be free to access* until the end of 2014 so they’ll reach the widest possible audience. We hope you’ll support Biomaterials Science by submitting your next article to the journal. Sign up sign up for the Biomaterials Science RSS feed or Table of Contents alert to read the first articles once they’re published online. You are currently browsing the archives for the Focus on Topics category.